Time for my second batch of Friday favourites! Despite it being my birthday this week (23, sob!) I haven't been anywhere all that exciting as the weather has been awful here! so, so miserable. First, non-beauty related we have (in that little white packet that you can barely see) salt & vinegar nuts. I know, weird, but I've been scoffing them like crazy. I hate S&V crisps but there's something about these! The little packet above is peanuts and almonds from my graze box but I also buy them in bags from the supermarket (M&S do the best ones though)... It has to be better than chocolate biscuits... right?! I've also been taking my spirulina tablets religiously the past two weeks and I really feel like they make a difference in my skin and also make a big difference in my sugar cravings. I've been taking two first thing in the morning with some water (they don't taste of anything really) and then two more at tea time if I remember (or am about to eat something very unhealthy haha) I've had a big box of cadbury heroes right by the sofa all week and haven't opened it once! Victory. I've also been going back to basics this week and using very little on my skin. It wasn't behaving at all and the moment I started using Kahina Argan Oil* again is literally breathed a sigh of relief and returned to it's semi normal state. I only have a very tiny amount of this oil left now and a repurchase is without a doubt going to happen. Unfortunately you can't buy this 30ml size on it's own here in the UK, it's available in a set which is rather expensive though good value for what you get. Naturisimo also have an offer at the moment where you get a free 30ml Argan Oil with any Kahina purchase, so perhaps that's an option (I'm thinking their toning mist?). The other option is ordering from Amazingy, a german green beauty retailer who stock the 30ml oil on it's own (£28 plus about £4 shipping). So many options, what would you do? Lastly I've been using the 100% Pure Tinted Moisturiser* just to even out my complexion during the day so I don't have a shock when I look in the mirror hahaha! The coverage is very light but it makes a difference and makes me feel a little more put together, if I'm heading out a little concealer over my scars and some eyeliner and I'm good to go! Love all these products! The ELD4OLO range is truly magical and K especially adore the cleansing oil. 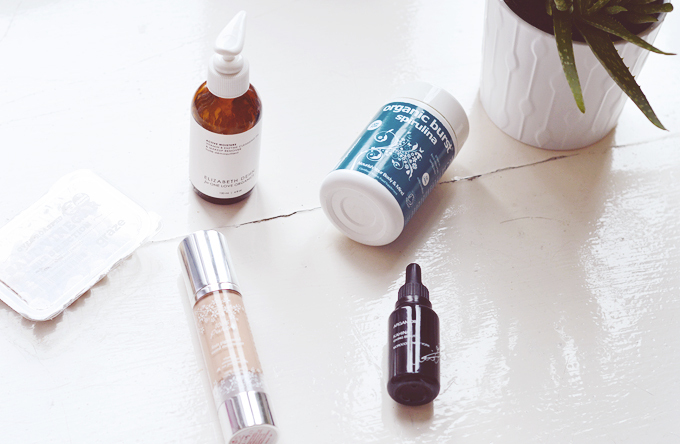 Also, Kahina has some new products that have made it to my wishlist. I've tried and loved the 100% Pure Tinted Moisturizer as well, but would love to try more from them like the Foundation, Concealer, and eye products. Have a lovely weekend, Annabel! P.S. This week, I had my birthday as well! What day for you?